A tool to model, visualize and simulate Boolean Networks. 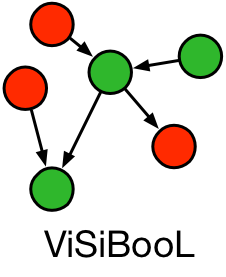 ViSiBooL is a tool for GUI-based modeling of Boolean Networks. It supports an extended version of synchronous Boolean Networks with temporal predicates. ViSiBooL allows user-friendly modeling, organization and visualization of these networks as well as attractor simulation for different experimental setups like e.g. knock-out experiments. ViSiBooL supports SBML-qual as well as BoolNet-syntax(BoolNet). With its graph-based representation of the whole network as well as the transitions functions of regulatory factors, ViSiBooL aims to increase clarity in Boolean Network design and also to reduce expenditure of time and errors in the modeling process. All the system dependent installer-files include a version of the Java Runtime. To run the .jar file the current Java Runtime (>8.90) has to be installed manually (download Java Runtime). To launch the .jar file make it executable and use double-click or enter 'java -jar ViSiBool1.01.jar' in the corresponding folder in command line. The OS X application can be installed using the .dmg file. On Windows ViSiBooL can be installed using the windows installer. To install ViSiBooL on Debian systems, please download the debian package and then run "sudo dpkg -i visibool-1.0.deb" in the command line. After installing ViSiBooL an examplary file, a model of the mammalian cellcycle can be started as exemplary network model. After launching the ViSiBooL application the example can be loaded by clicking "load example network" in the middle of the window. 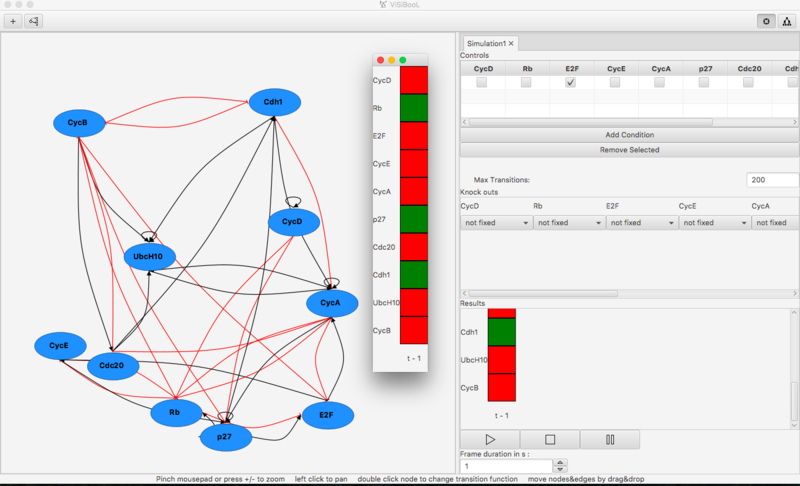 A network model of the mammalian cellcycle and an exemplary simulation setup are loaded. You can also download the example file cellcycle.visibool (Right click and save link as..). In some browsers the file extension might be changed. The file then has to be renamed to cellcycle.visibool again. A manual of ViSiBooL is available via the help-menu of the application itself.